Merry Christmas from Maban, South Sudan, where Niamh Fleming-Farrell sends dispatches from the frontline of aid workers there. 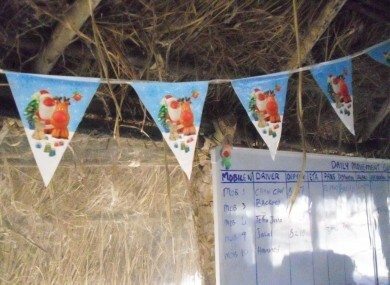 A small touch of Christmas cheer in the GOAL main office in Maban County, South Sudan. IT’S 40 degrees out. While the generator is off, perspiring staff swat at bugs hovering before their illuminated computer screens. Relief comes when the power kicks back in at 7.30pm, and discomfort is alleviated as the air is moved and the insects are scattered by the resumed whirring of a fan. Someone suggests some Christmas music – the first of the season. Soon the strains of Judy Garland’s Have Yourself a Merry Little Christmas fill the thatched, open-sided hut that serves as GOAL’s main office in Maban County, South Sudan. “This will be the first Christmas I spend actually in the ‘field,’” says Evelyn Moorehead, GOAL’s emergency coordinator in Maban. The Galway native has previously spent the holiday season away from home, but at one of the Irish aid agency’s administrative hubs, where modern comforts tend to be a little closer to hand. This year, however, as GOAL’s work continues throughout the holiday season, Evelyn made the decision to forego Christmas at home. In doing so, she’s also foregoing 24-hour electricity, hot showers and days free from worry that a scorpion is lurking beneath the loo roll; instead, she will oversee the provision of services to tens of thousands of refugees. In this dusty corner of the world’s youngest country, some 40 kilometres from the border with Sudan, GOAL is part of a relief effort that is helping meet the needs of more than 100,000 refugees displaced by ongoing fighting in Blue Nile state. As the Sudan Armed Forces uses what Human Rights Watch describes as “indiscriminate bombing” to suppress a rebellion by the Sudan People’s Liberation Army – North (the successor of the SPLA in the contentious border states of Blue Nile and South Kordofan), refugees, many of them children, have walked for days or weeks to reach safety in Maban County. But while they are not under fire in Maban, the refugee community in this rural area is dependent on humanitarian assistance to meet their needs: clean water, food, shelter, health care and education. Already providing some services in the county, GOAL was one of the first agencies to respond when the influx of refugees began in late 2011. Now, a year later, Evelyn’s team operates clinics, nutrition programmes, and water and sanitation facilities that serve over 38,000 members of the refugee community in three of the county’s four refugee camps. This team needs support “to ensure continuity of services throughout the (festive) period,” she says. But GOAL’s beneficiaries aren’t the only ones with needs at this time of year. The multicultural team at the GOAL compound (Evelyn is in fact the only Irish national there over the holiday season) craves all the trappings of a traditional Christmas – tinsel, turkey and tipple among them. But in this remote corner of Africa, which is inaccessible by road for much of the year, obtaining such seasonal basics requires the foresight, creativity and planning of a well-trained logistics team. Likely it’s a good job then that on the site of an emergency relief operation expertise in this area abound. Evelyn began planning for Christmas Day in Maban last month, when while on leave in Ireland she stocked up on fairy lights and decorations at Penneys. The fruits of this shopping trip, incongruous in the bright sunshine of sub-Saharan Africa, now twinkle and sparkle from the rafters of the GOAL office. On route back to South Sudan, the 30-year-old also took advantage of a stopover in Nairobi to go on a grocery-shopping spree. In Maban, where stewed goat meat is the daily staple, Evelyn says the three C’s – chocolate, coffee, and cheese – are highly coveted items. The true weight of Evelyn’s disappointment however was only disclosed by her elation when the forsaken boxes unexpected showed up a day later. Racing across the compound at news of their arrival, she whooped at the sight of the battered but still intact parcels. Some of the provisions (the smoked salmon) had not survived the journey, but such losses made little dent in the general air of delight as Evelyn rifled through her goodies, then promptly, with the help of a colleague, removed them out of sight. “Yes, they must stay locked away otherwise they will not survive until Christmas Day!” she says. Also under lock and key at the compound is the alcohol supply, which another colleague flew in several weeks ago aboard a cargo plane. In Maban, the local village’s sole bar, a yard filled with plastic furniture, serves either cans of Heineken or bottles of an Ethiopian brew called Meta beer. The locked trunk at the compound, however, contains the prospect of more spirited beverages and homemade cocktails. There remains, however, the challenge of the roast. Turkey is unavailable and thus ruled out; duck or chicken might suffice, but acquiring a suitable bird is just the first problem. At GOAL Maban, fuel is limited, so power is rationed; accommodation is in basic tents and tukils, the latter cohabited on occasion by an assortment of wildlife including bats and rats; the latrine is a hole in the ground; and a shower consists of a bucket, a water scooper and a bar of soap. In the run up to Christmas though, the award for the most missed household convenience likely goes to the simple kitchen oven. At present, all the cooking at the compound is done over charcoal fires as it is impossible to procure gas locally. A week ago, when the prospect of duck for Christmas dinner was raised, momentary enthusiasm dissipated with the reflection that the meat would probably have to be boiled. Since then, Evelyn says, creativity has taken hold, and the team’s meat-eaters may yet get their much longed for Christmas roast. She speculates that if the oven is a success there may even be some roast potatoes. But whether there’s a roast dinner or not, the Maban team will make the most of the occasion and each other’s company. Email “My Christmas Day: Boiled meat with the prospect of scorpions”. Feedback on “My Christmas Day: Boiled meat with the prospect of scorpions”.